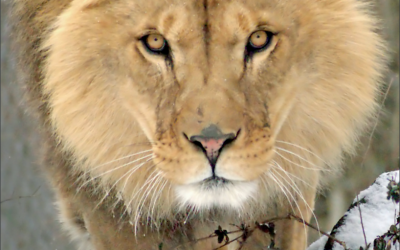 Read more about all the exciting happenings in our sanctuary this season. 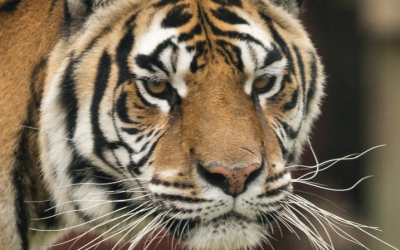 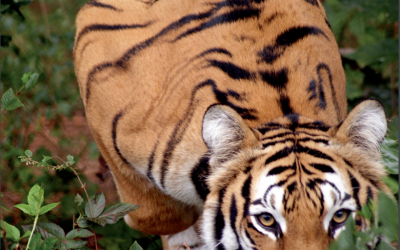 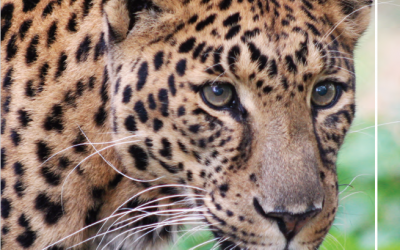 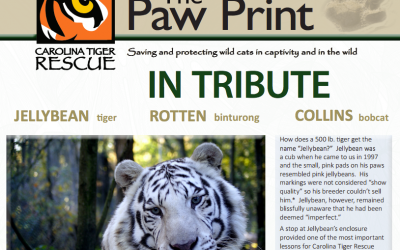 There are several ways Carolina Tiger Rescue expresses its dedication to conservation. 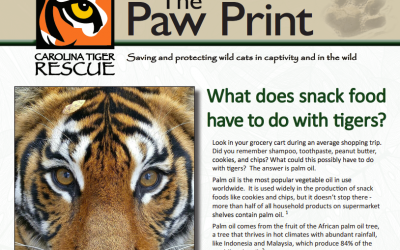 Find out more in the latest edition of the Paw Print. 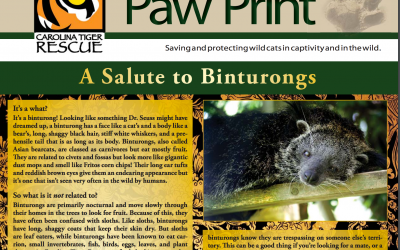 In the Winter 2017 issue of The Paw Print, learn how we keep our promise to give rescued cats the best life possible, what life in a roadside zoo means for wild cats, meet Tasha Tiger, and learn how we adapt our care to a new animal’s needs. 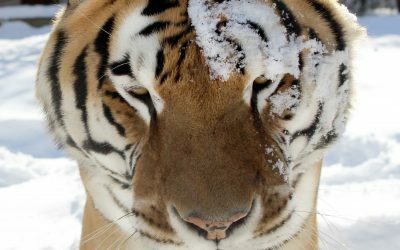 You will also find information about our 11th annual Black Tie & Tails Ball on February 24, 2018! 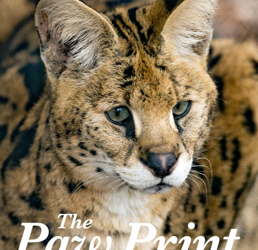 In the Fall 2017 issue of the Paw Print, we Honor International Tiger Day, talk about what it means to have a wild cat as a pet, introduce you to Daxon Serval, and explain how new animals are introduced to the sanctuary. 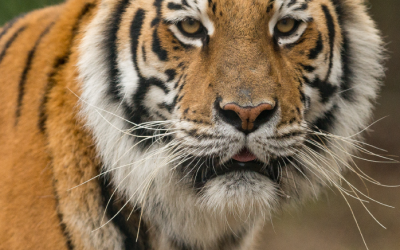 Read about our wonderful Volunteers of the Month, our 11th annual Black Tie & Tails Ball, and learn how you can come out to meet the residents and get involved. 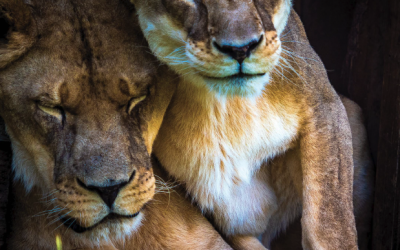 In the Spring 2017 issue of The Paw Print you will meet some of our newly rescued animals and learn more about why these animals will need to remain in captivity. 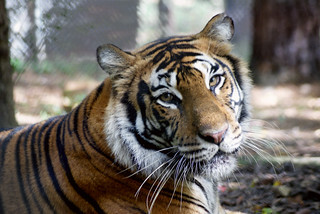 See how much fun it is to attend our Black Tie & Tails Ball, find out more about summer camp at Carolina Tiger Rescue, join us in thanking our volunteers, and learn how you can come out to meet the residents and get involved. 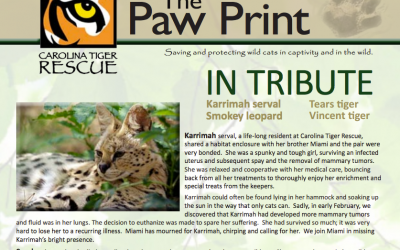 In the Winter 2016 issue of The Paw Print, you can read about Carolina Tiger Rescue’s largest rescue, meet 10 of the new animals, and learn how you can meet the animals and get involved. 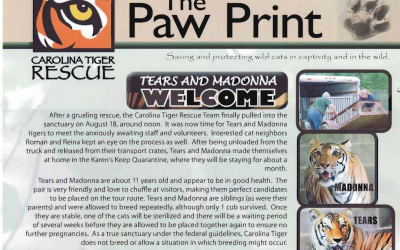 In the Fall 2016 issue of The Paw Print, you can find out more about Carolina Tiger Rescue, its history, volunteers, staff and how you can meet the residents and get involved.